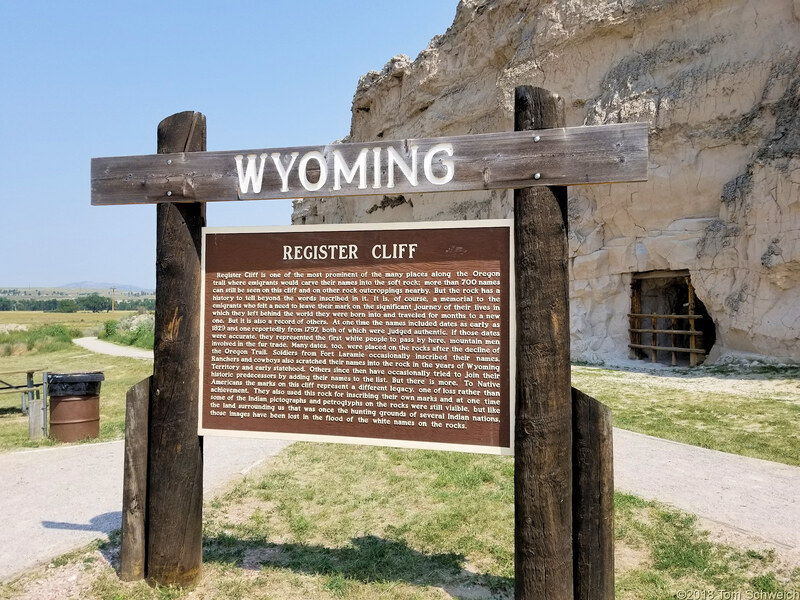 Register Cliff is one of the most prominent of the many places along the Oregon trail where emigrants would carve their names into the soft rock: more than 700 names can still be seen on this cliff and on other rock outcroppings nearby. But the rock has a history to tell beyond the words inscribed in it. It is, of course, a memorial to the emigrants who felt a need to leave their mark on the significant journey of their lives in which they left behind the world they were born into and traveled for months to a new one. But it is also a record of others. At one time the names included dates as early as 1829 and one reportedly from 1797, both of which were judged authentic. If those dates were accurate, they represented the first white people to pass by here, mountain men involved in the fur trade. Many dates, too, were placed on the rocks after the decline of the Oregon Trail. Soldiers from Fort Laramie occasionally inscribed their names. Ranchers and cowboys also scratched their names into the rock in the years of Wyoming Territory and early statehood. Others since then have occasionally tried to join their historic predecessors by adding their names to the list. But there is more. To Native Americans the marks on this cliff represent a different legacy, one of loss rather than achievement. They also used this rock for inscribing their own marks and at one time some of the Indian pictographs and petroglyphs on the rocks were still visible, but like the land surrounding us that was once the hunting grounds of several Indian nations, those images have been lost in the flood of the white names on the rocks. Field Notes: 13 Aug 2018. US Highway 26: in Guernsey.